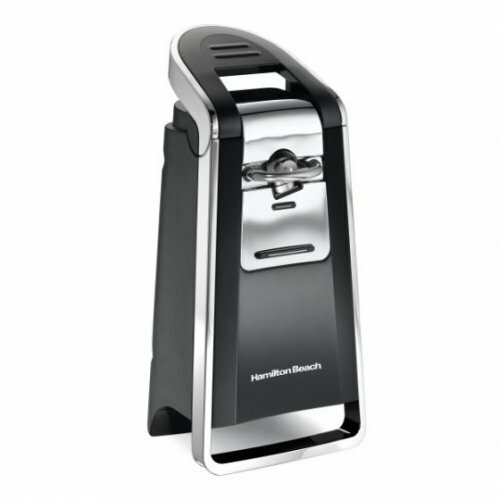 Unlike most can openers, the Hamilton Beach Smooth Touch Can Opener is designed so the blade cuts along the side and not into the top of the can. This minimizes the blades contact with food and prevents splashing or seeping out from the top since the can remains closed until you lift the lid. The result is a mess-free, smooth cut that allows you to remove the top without worrying about sharp edges along the lid. The large ergonomic lever is easy for anyone to use. Operation requires little grip strength, just hold lever down until the blade has made a full rotation around the can. With its sleek chrome and black design, this functional can opener blends well with other countertop appliances and makes a classic addition to your home.